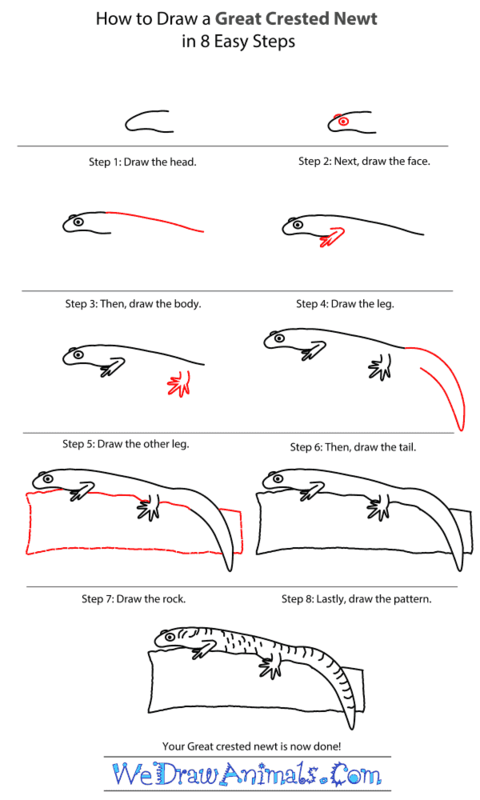 In this quick tutorial you'll learn how to draw a Great Crested Newt in 8 easy steps - great for kids and novice artists. 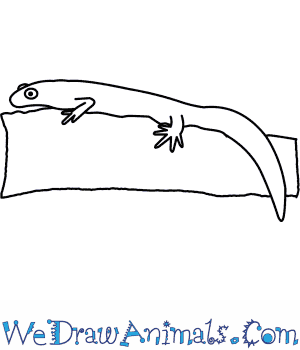 At the bottom you can read some interesting facts about the Great Crested Newt. 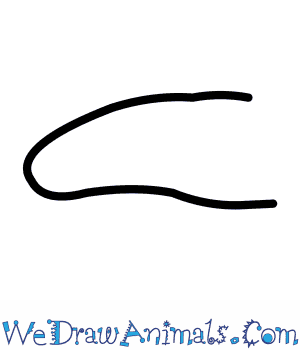 Step 1: For the head, draw a sideways curve; the bottom end should bend up slightly, then curve farther down. 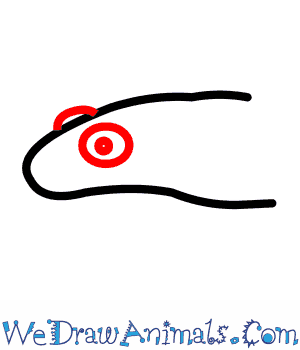 Step 2: Draw a small semicircle on top of the head. Below this, draw a circle with a dot in it. Step 3: Draw a line going down from the back of the head. Step 4: Under this line, near the back of the head, draw a ling the angles down and back, bends down and forward, then zig-zags into three toes, finally meeting the bottom the head and going up a little bit from there. Step 5: Near the end of the body, draw a line that curves down, zig-zags into a five-pointed foot, and then curves back up. 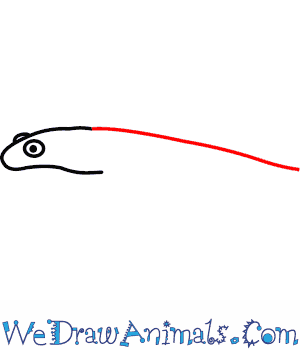 Step 6: At the end of the body, draw a long line that curves down and then back up for the tail. Step 7: Draw a rectangle under the body. 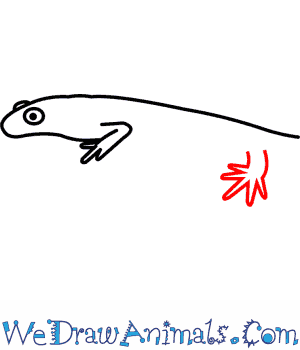 Add some wavy lines on its topside that meet the head, feet, and tail so that it is clear the newt is laying on it. Step 8: Draw a pattern of small lines all over the body. Done! You can color it dark greyish-brown, with black splotches and a yellow or orange underbelly. The Great Crested Newt is a member of the amphibian group and the scientific term for them is Triturus cristatus. 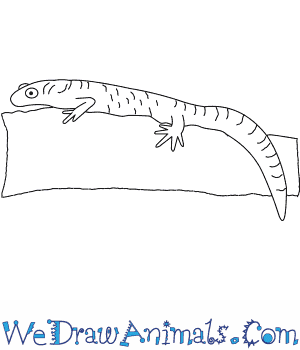 Other common names for this species are the Northern Crested Newt and the Warty Newt. 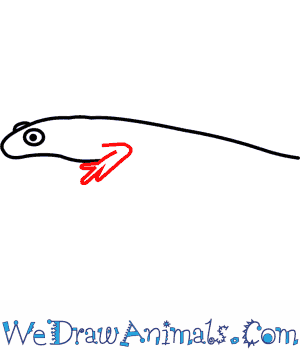 They are part of the Salamander family and live in northern Europe and western Asia. These creatures have dark greyish brown backs and covered with darker spots. Their bellies are yellow or orange and covered in large black blotches that are a unique pattern to each individual. Males have a crest on top of their body and silvery stripe that runs along their tail. This animal was first documented in 1768. The species is up to more than .5 feet in length. They stay within 700 feet of their water source. The female lays up to 3 eggs every day for an entire season. They can live for up to 27 years old. As with all amphibians, the babies swim and breathe through their gills like a fish, until their legs and lungs develop and they can live on land like a reptile. 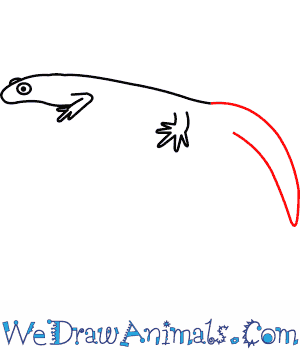 In this species of the Newt, the transformation takes place over the course of a season. These animals have a low population amount, but are considered to be the least concern for the possibility of extinction.